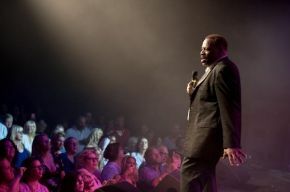 American born, Alexander O'Neal has created a cult appreciation across the globe. His back catalogue transporting his singles in to the UK and Billboard top ten’s as well as a triple platinum selling album and ever expanding discography. 2018 will see the release of Alexander’s first original studio album for 15 years, and fans are in for a treat when they hear how one of the greatest voices of all time has matured into a sensational soul and blues sound. With the release of his hard hitting, blockbuster autobiography in early 2017, a 50 date UK tour to celebrate 30 years of the iconic Hearsay album, it’s safe to say that fans still can’t get enough of the man from Minneapolis!